The next post you read here will be written by a guest Blogger from Queens, NY. I in turn, will be posting my writings there for the day. Stay tuned for Tuesday's show! The other nationally recoginzed Bloggers listed below will also be trading off posting duties in their respective market places. 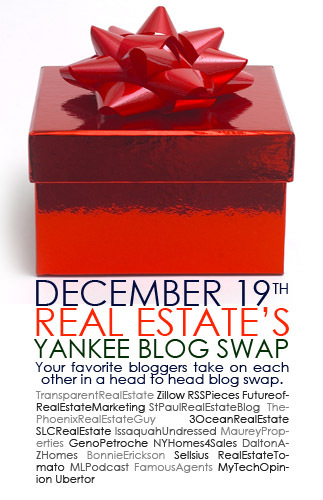 Its Real Estate's 'First Annual Yankee Blog Swap' and I am indeed, honored to have been asked to contribute. Living on a Niche Cul-de Sac? "So How Do You Really Feel About That, Geno?" A.Finkl and Sons Moving South(side)? Make Me Move? Take A Swing! OK...What Exactly Is A Bubble?